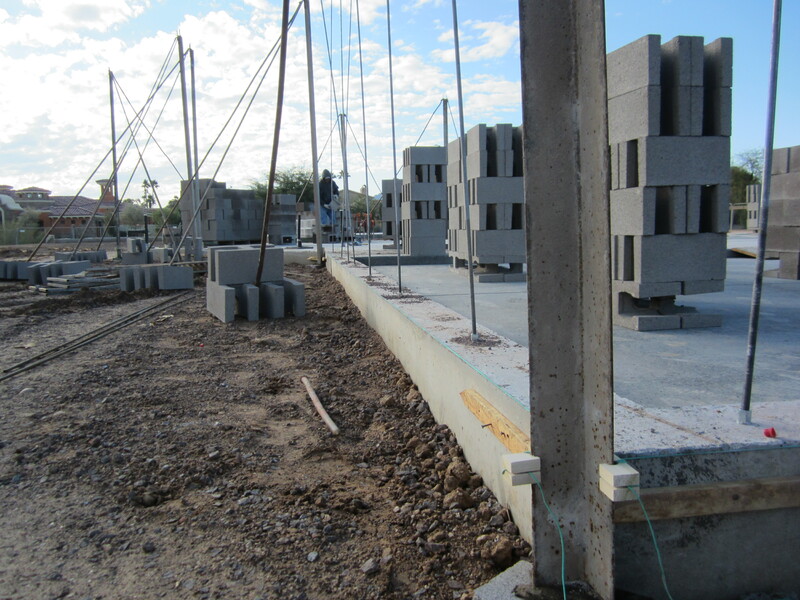 Now that the floor is poured, the Block are delivered along with the Integra rods. These rods are 7/16″ wide, galvanized, and are screwed into the couplers in the stem walls. they are designed to be 3-4″ higher than the top of the wall so that the wood top plate can be attached. 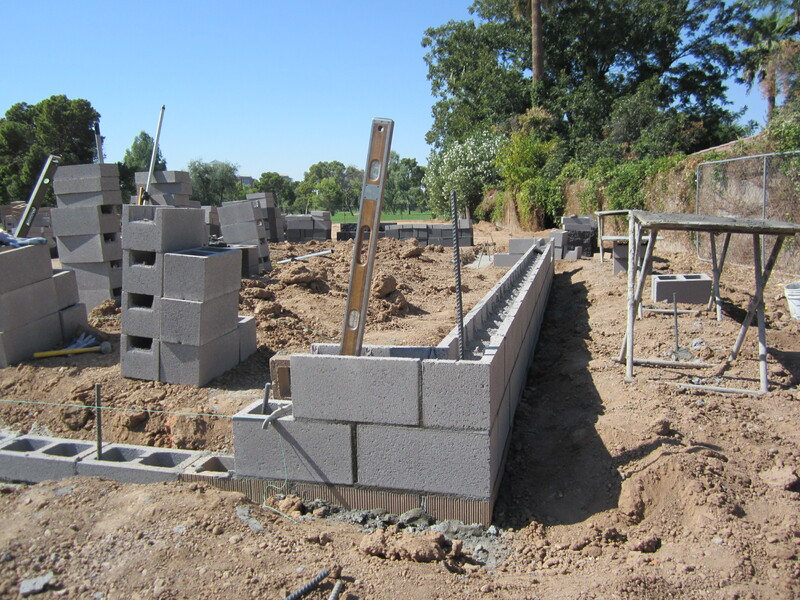 The blocks are then layed around the rods in sections called “runs” until the walls are built to full height. Notice in the photo below that the block are open on the ends in the shape of an “H”. 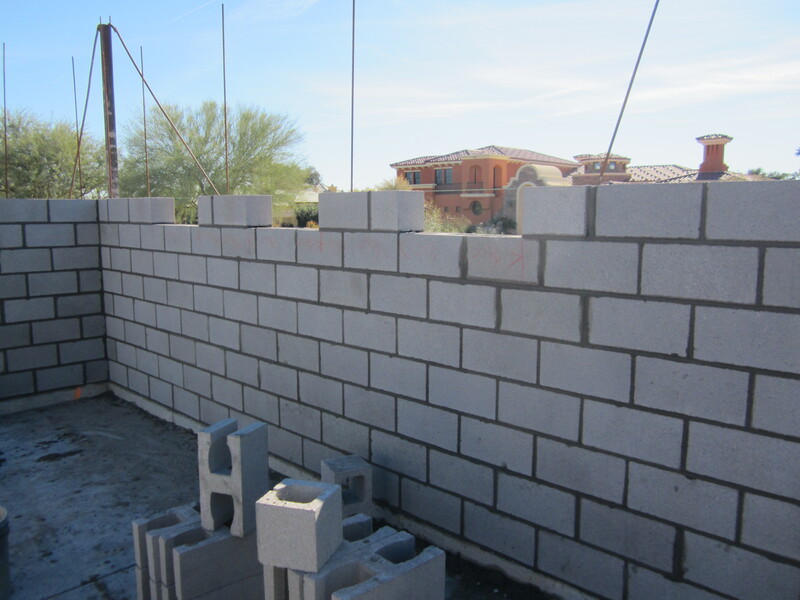 This helps increase the efficiency of the wall by reducing “Thermal bridging” which occurs when heat travels from one side of the wall to the other through material that conducts it. The foam that is sprayed into the wall is a great insulator! Once the walls are complete, Superlite block comes out and places a tension plate, a washer, another “Tension indicator” washer, and a nut over each rod. The rods are then tensioned to 7000 psi. Notice that the top block at each rod is a different “Tension Block” designed to distribute the tension through the rest of the wall. After the walls are tensioned, Superlite’s technicians spray foam into them. 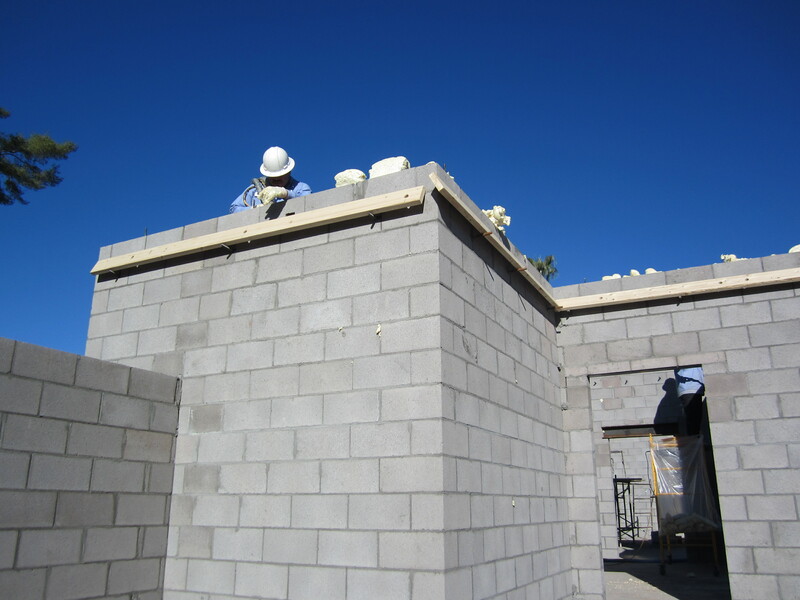 It is important for the masons to lay a “tight” wall because the foam will enter and come out of any voids left in the mortar joints. This can leave a big mess, and some annoyed Superlite Techs! In the picture below, you can see only three places where just a small amount of foam came out of our wall. The foam that you see coming out of the top of the wall is normal. It is allowed to dry, and then is cut off and recycled. 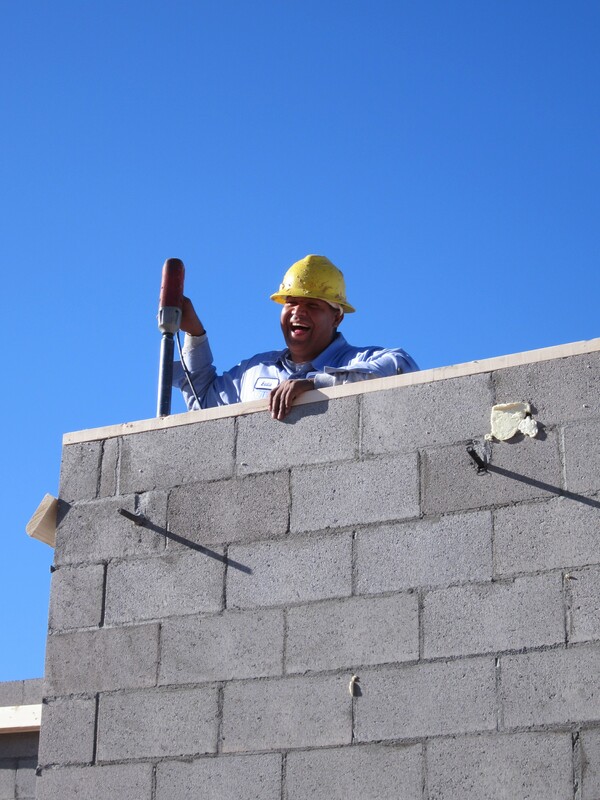 A happy Superlite Block Tech shows how much they enjoy working with the Darrin Gray Corporation. Here, he is adding the wood top plate after the foaming and tensioning of the walls. The house is now ready for the Carpenters. 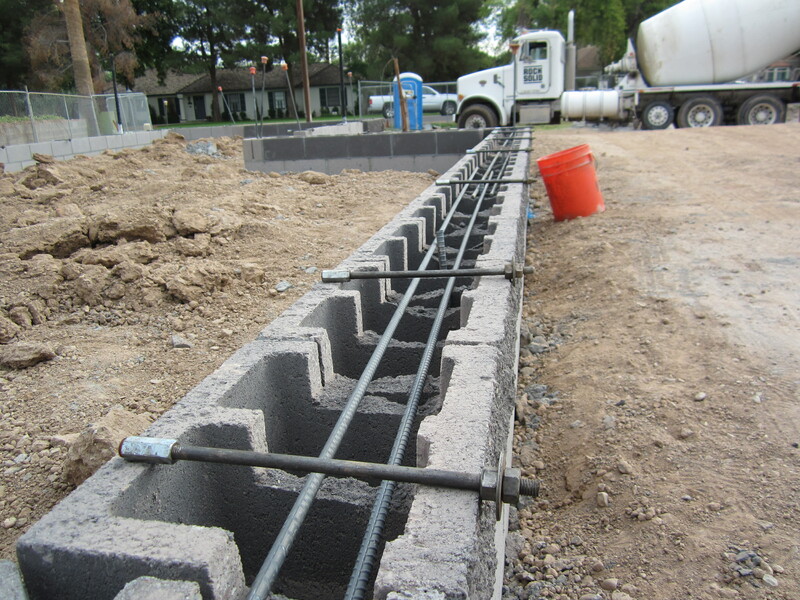 Once the Stem wall is built, rebar installed, and Integra bolts layed out, it is time for it to be inspected, and grouted. Once the grout is placed, the grout is scraped level to the block, and the integra bolts are placed into the grout according to a plan outlined by the Integra Engineers. This is the Completed Integra Stem Wall. The Integra bolts have been placed precisely where indicated by the integra engineers. Once the stem wall is complete, it is time for the plumbers and electricians to place their “underslab” piping in its position. Then the stem wall is back filled with dirt, and compacted, a layer of ABC (rock and sand) is placed on top of that leaving about 4″ remaining for the concrete floor to be poured to the top of the stem wall. One of the things that Darrin started doing back in the early 90s, was to add an extra rebar at all gate columns. Gate columns get extra wear and tear on them due to the weight of the gate, or heavy use. Darrin decided that it is easier to add an extra rebar to each gate column, than to go back and fix the occasional loose one. Notice the two rebar coming out of the footing in the above photo. Adding an extra rebar to the gate columns is just one of the many ways that the Darrin Gray Corporation adds value to your Block Fence. This is the “After” photo. From the outside of the Columns, you can not see that there are two rebar inside. Beauty may be skin deep, but quality penetrates to the core. This particular fence will soon be painted, have wrought iron panels attached between the columns, and a custom gate installed to complete this project. 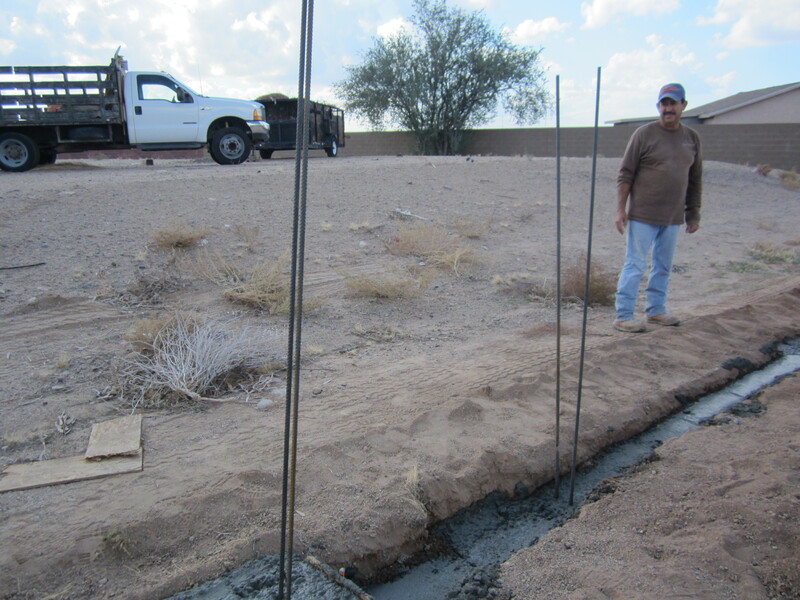 The photo below is of a footing that was recently poured for a custom home that we are building in Central Phoenix. 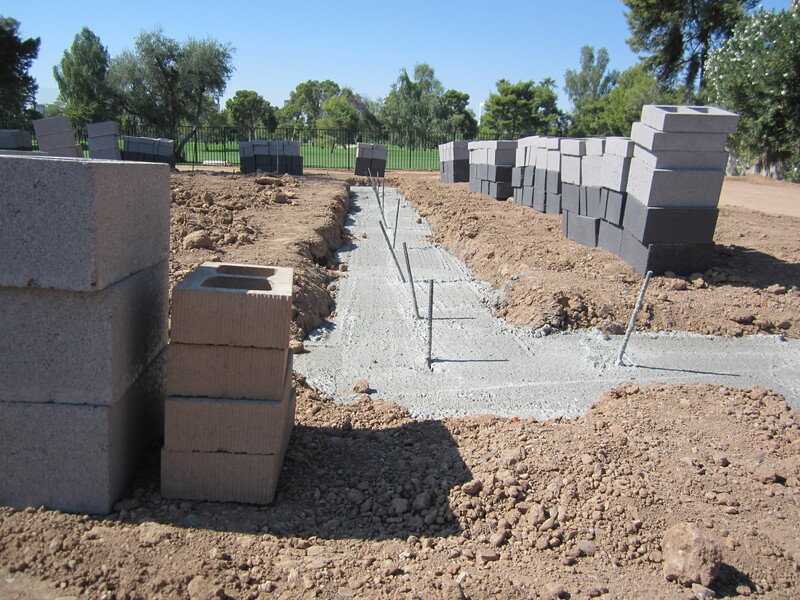 (A footing is a foundation usually out of concrete that is used as a base to support the weight of your house. ) 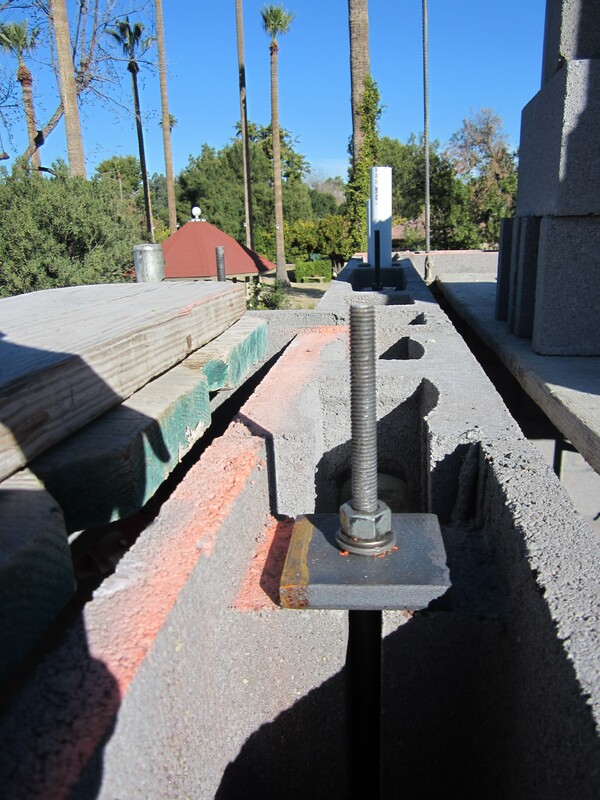 Many houses start out this way unless they are using a Post-tensioned slab. (We can discuss that at another time.) You can see rebar coming out of the footing that will provide a connection between the footing and the stem wall. In the photo above, you will notice a channel running through the top row of block. This channel is an opening for the masons to place horizontal rebar into. When grouted, (filled with concrete) that top row of block is called a bondbeam. A bondbeam adds strength to a wall. It combines the weight bearing properties and rigidity of block, with the strength and bendability of rebar. 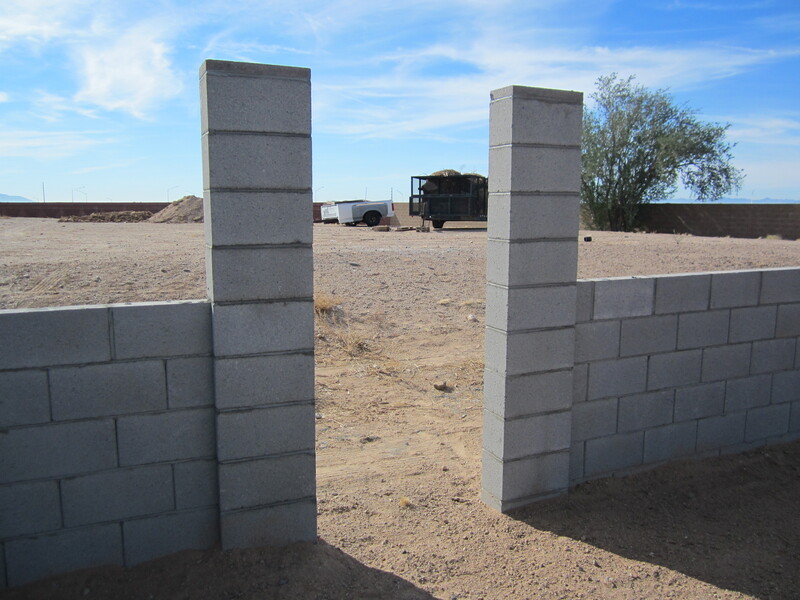 The Integra wall system, http://www.superliteblock.com/integra_introduction.htm was invented in the 1980s by Paul Scott; a structural engineer in the Phoenix area. He partnered with Superlite Block to produce this energy-efficient building system. It didn’t take long for homeowners to see the advantages of Integra… Combining the strength,and durability of Post-Tensioned block construction with the energy efficiency of a proprietary polyurethane foam insulation that is sprayed into the masonry cores after construction. 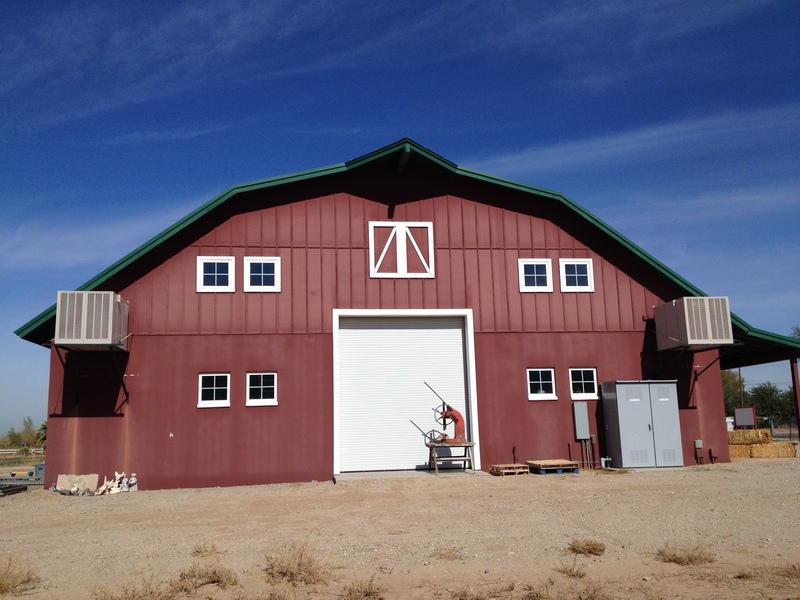 The above photo is of an integra block shop that we built for “Grandma’s Farm” in southern Phoenix. 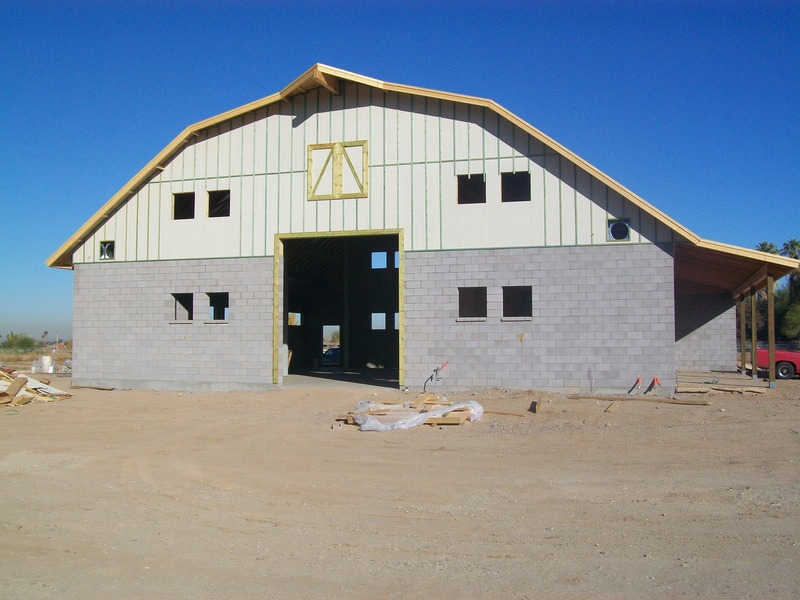 We used 8″ wide C.M.U (Concrete Masonry Units). 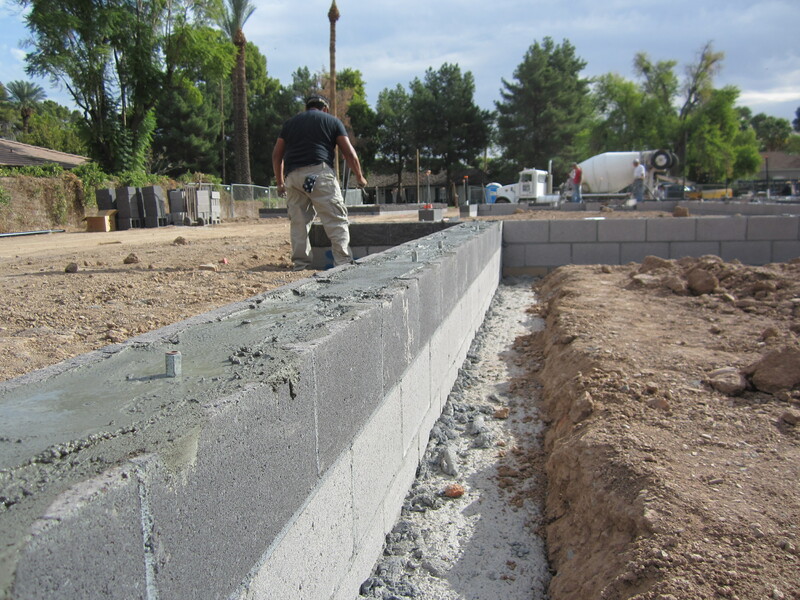 As you can see, the Integra Block looks just like a conventional Masonry building once the construction process is complete. 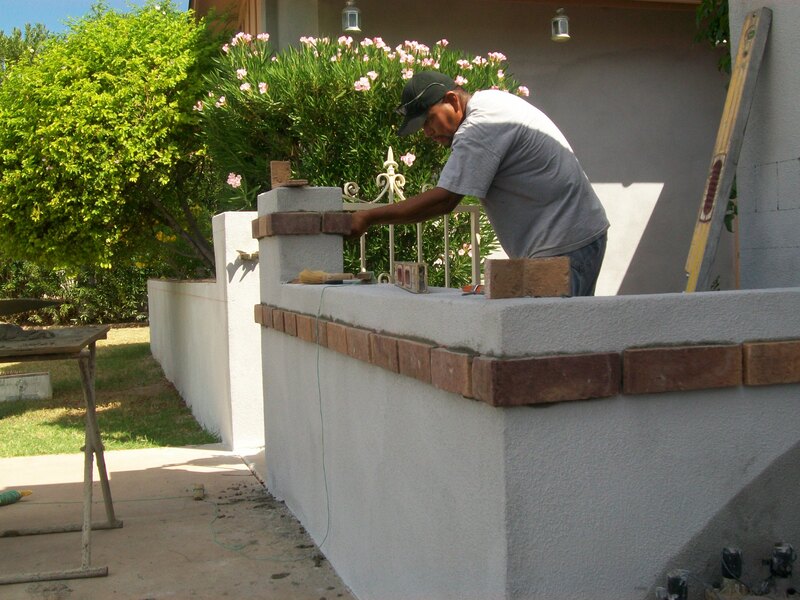 An Integra wall can be finished just like any other block wall with Paint, Stucco,or even a Brick veneer. 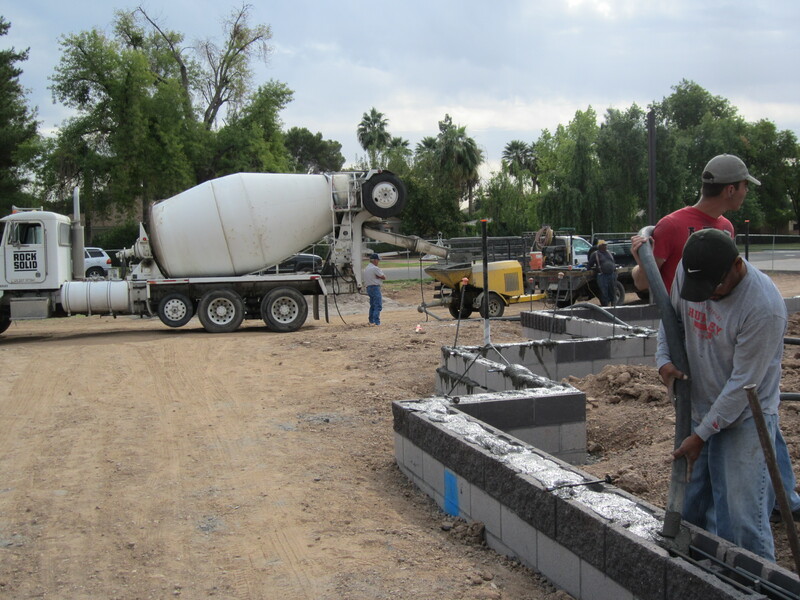 In the next month, we will be building another large custom Integra Block home in the Phoenix-Metro area. We will be documenting the wall construction process so that you can see the differences, and advantages of the Integra wall system. 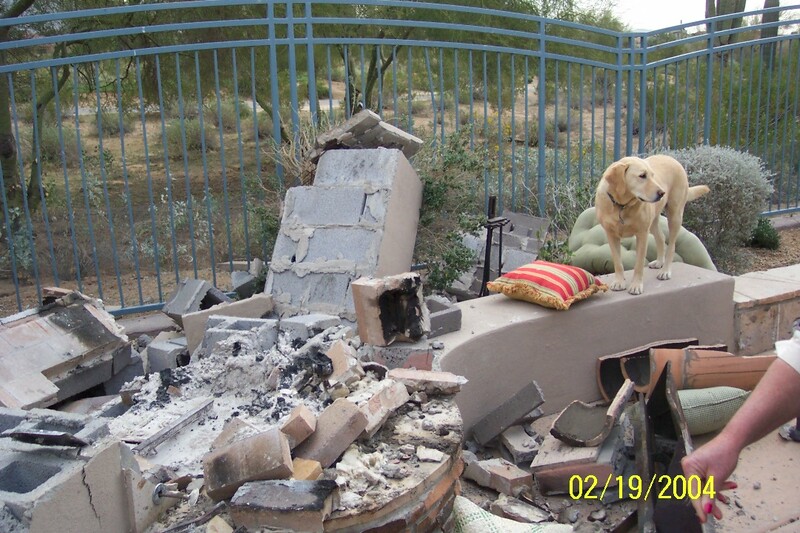 Here is an example of what can happen when you burn wood in a fireplace that was designed for gas. The Homeowner burned wood in his fireplace for a while, and then decided to switch back to gas. He neglected to clean out the ashes that had piled up over the burner. When he turned on the gas, it built up under the ashes and exploded when he tried to light it. This fireplace was not built properly and could not withstand the explosion. 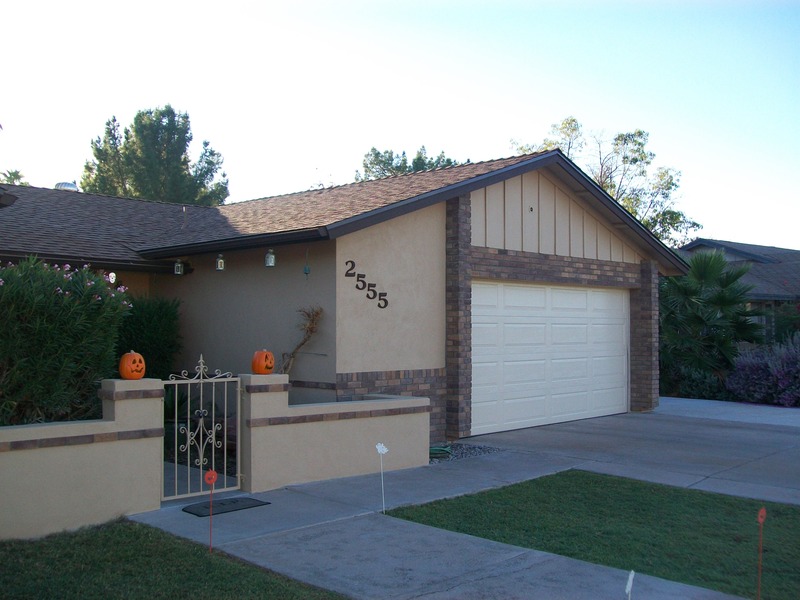 The insurance company called us to rebuild and repair it because they knew it would be done right! This outdoor fireplace was constructed without rebar (reinforcing rods) and grout (concrete) in any of the open cells in the walls. The result was a destroyed fireplace,and a seriously injured homeowner. There would have been considerably less damage to the fireplace had it been constructed properly. As it was, the homeowner was lucky to be alive after being knocked unconscious and blown into the swimming pool with 100 lb. chunks of the fireplace found up to 50 feet away. Luckily for him, his wife was inside the house, heard the explosion, and decided to investigate. There are many people who trust landscapers, or unlicensed contractors to build their fireplace,or repair your wall, fence, or BBQ. You wouldn’t trust a plumber to do electrical work at your house would you? You can count on The Darrin Gray Corporation to make sure that your masonry barbecue, fireplace, home,fence or block wall repair will be done right. If you are planning a remodel, consider using brick or block to add to its value. Brick is a durable material that never needs paint and adds beauty and style to your home. Masonry walls need less maintenance than wood. This characteristic will save you time and money over the life of your home. This is Oscar, one of our talented (and camera-shy) masons. 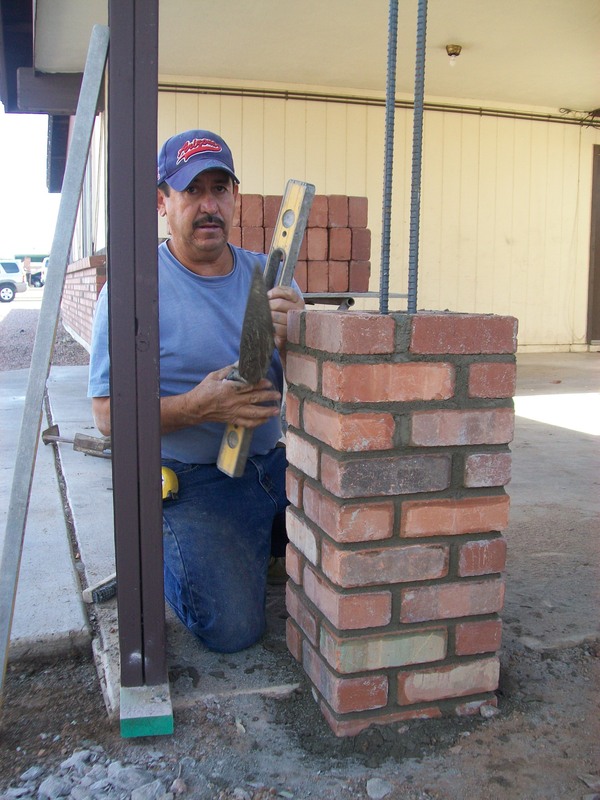 He is adding brick to a carport support column in a residential remodel. The brick columns will make a beautiful addition to this remodeling project.